Crowned World champions in Rotterdam in 2011, China’s Ma Long and Xu Xin added to their list of tiumphs in Panagyurishte on Sunday 19th August. The no.2 seeds, they won the Men’s Doubles title at the 2018 ITTF World Tour Asarel Bulgaria Open overcoming Japan’s Masataka Morizono and Yuya Oshima, the top seeds, at the final hurdle; they won in four games (9-11, 11-4, 11-8, 11-6). There was little to choose at the start of the opening game, both pairs trying to find a rhythm; however, after the first six points had been shared, Masataka Morizono and Yuya Oshima seized the advantage, they went ahead 6-3 and at 10-6 held four game points. Ma Long and Xu Xin won the next three points, Masataka Morizono and Yuya Oshima called “Time Out”; it proved a worthy call. The point of the match followed, a scintillating rally, it went the way of Japan. Masataka Morizono and Yuya Oshima held the early lead. Stung, Ma Long and Xu Xin dominated the second game, they went ahead 9-2, surrendering just two more points; they may be known for their powerful forehands but it was in the short play where they excelled. In the opening game, Masataka Morizono had been very effective with the “banana” return of service, forearm vertical, wrist relaxed, the racket circumnavigating the ball to produce a cocktail of top spin and sidespin. In the second game that ploy was nullified. Now confident, in third game, just as in the second the Chinese duo raced away, they went ahead 8-2 and then 9-3, the stage at which they started to make errors. Was there a degree of over confidence, a lack of concentration? Masataka Morizono and Yuya Oshima reduced the deficit to two points at 9-7; Ma Long and Xu Xin called “Time Out”. 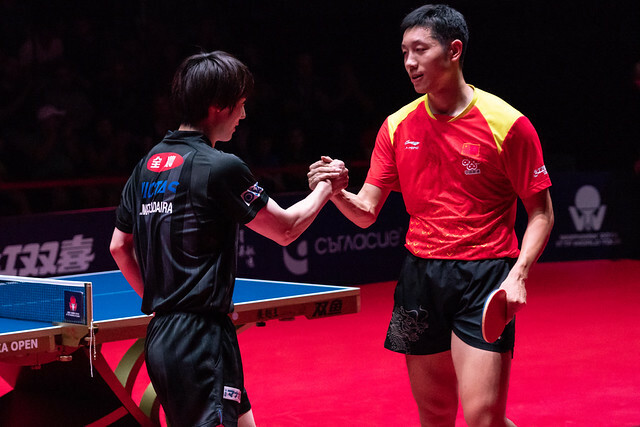 Masataka Morizono and Yuya Oshima won the next point but they were to win no more; Ma Long and Xu Xin had stemmed the tide. Taking risks, seizing any chances on offer, in the fourth game Masataka Morizono and Yuya Oshima established a 5-1 lead. It was at that stage Ma Long and Xu Xin woke up; they won the next eight points before surrendering just one more to seal the match and the title. In their ninth career ITTF World Tour Men’s Doubles final, they had won for the ninth time; the perfect record was maintained.